Students bond over a bowling match at Kedma’s TerpZone Takeover. Liana Chesir/Mitzpeh. Members of Kedma, the Orthodox community at this university, trekked through the cold to kick off the semester at TerpZone Thursday night. Over 100 participants showed up to TerpZone Takeover, which proved to be more than just a catchy name on the Kedma Facebook group. “I wasn’t expecting this many people to show up, especially with the weather,” said Kedma President Tamara Soleymani, a junior government and politics and psychology major. “Honestly, I was surprised by the turnout. 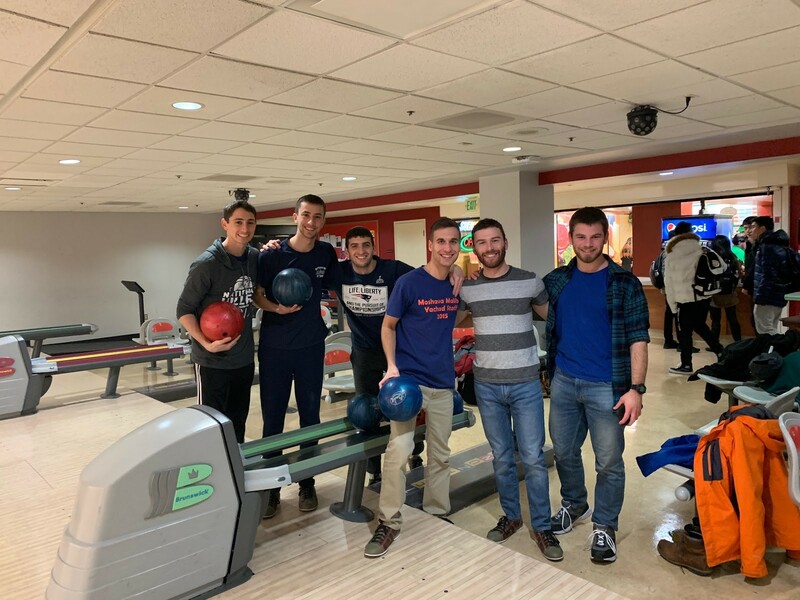 When I got in, I didn’t expect all eight bowling lanes to be taken,” added Nadiv Panitch, a sophomore computer engineering major who was in attendance. Kedma Social Chair Liana Chesir, sophomore studio art and marketing major, planned the event. Chesir tried to create the event last semester but struggled to get funding from SGA. “Since we’re a religious group, they [SGA] only want to give us funding for like religious events, so we had to market this as a pre-shabbos, like spiritual, getting you into the spiritual mindset sort-of evening,” said Chesir. SGA funded nearly the entire event. Kedma only paid for the snacks, which TerpZone required Chesir to purchase from within STAMP, according to Soleymani. TerpZone also restricted music to their own Pandora playlist, Chesir said. Kedma has hosted many social events in the past, ranging from Cupcake Wars to ice skating and a paint night. In their second semester on the Kedma board together, both Soleymani and Chesir wanted to create more fun opportunities for Kedma beyond the Hillel building. Sam Finkel showcases his pool expertise. Liana Chesir/Mitzpeh. The four hours of the event were filled with games of pool, bowling and spending time with friends. Students had many reasons to look forward to attending. 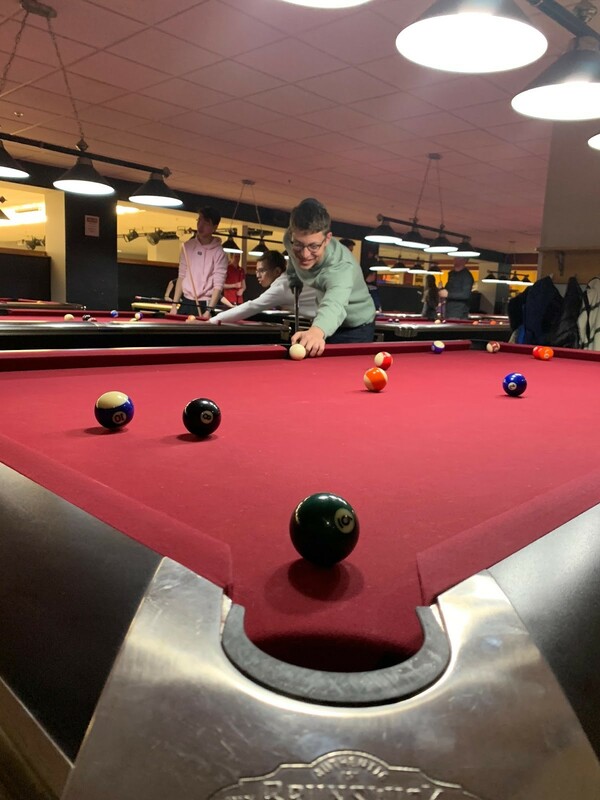 “I thought it would be a good chance to hang out with friends before the semester kicks off with a ton of crazy work, and I love bowling,” said Panitch. Kedma welcomed old members of the Orthodox community and discovered some new faces. Kedma hoped that offering a variety of activities would help foster a diverse body of students. “For people who didn’t feel so comfortable going out Thursday nights, this exposes a whole new activity for them, which is really nice…and also people are making new friends. I know I did,” said Chesir. Additionally, the open environment helped create an open community. TerpZone Takeover may just be the beginning of a new reputation for Kedma. “I think it set a really good tone for the rest of the semester. People can see that Kedma isn’t just a small group of exclusive students…it’s a bit more inclusive than it might seem on the surface,” said Soleymani. “We have a lot of things up our sleeve for the rest of the semester, you’ll just have to stay tuned for those,” said Chesir. No Replies to "Bonding warms Kedma community at TerpZone"